« Green Fruit Smoothies – what a wonderful start to my day! 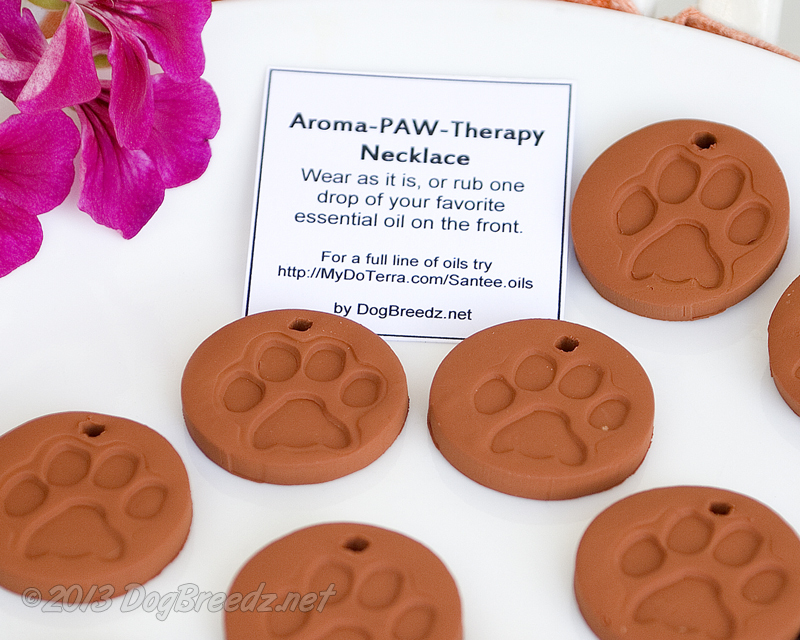 Brand new from the Canyonview Studio at DogBreedz.net – the AromaPAWtherapy Necklace! 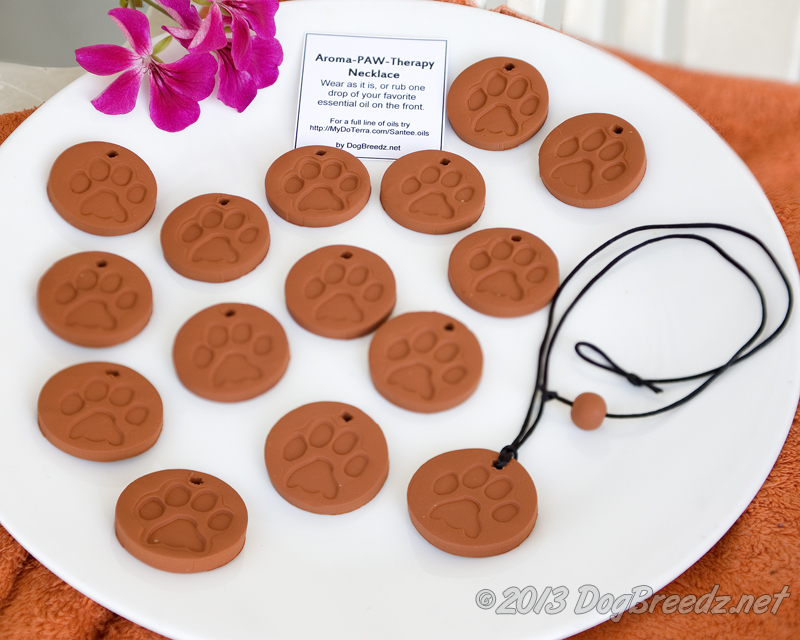 This beautiful terra-cotta pendant will compliment almost any outfit and will show your love for the animals in your life. Just under 1.5″ in diameter, the charm features a bold paw print and is held on a satin tie. The “clasp” is a matching terra-cotta bead and loop closure. A handsome piece on its own – but it gets even better when you realize it is also a piece of original aromatherapy jewelry. Just add ONE drop of your favorite essential oil to the FRONT of the necklace and rub it in. The oil absorbs into the clay and allows you to experience the power of essential oil aromatherapy throughout your day. It’s like having your own personal diffuser! One drop is all it takes and you can change essences each time you apply – the most recent application will be the strongest essence. I suggest you only apply it to the front so there won’t be any oils rubbing against delicate fabrics. To purchase Necklaces ($16 each plus $3 shipping to USA/Canada – shipping to other countries may vary) or to inquire about wholesale pricing, just email me (DogBreedz (at) yahoo (dot) com). I use, love and rep doTERRA Essential Oils – you can find the full line of essential oils online here. Ready for the really FUN part of this post? I thought so! I am giving away FIVE necklaces to my readers! Just leave a comment below before 4:00 pm (California time) on 3/14/2013. I will run Random.org for five numbers and the corresponding commenters will win. If you live outside of USA or Canada, I ask that you cover actual shipping costs. Want better odds? Comment on my DogBreedz Blog and increase your chances of winning – I am giving away five MORE necklaces over there, too! NOTE: if you have any problems commenting below, just send me an email at DogBreedz (at) yahoo (dot) com and I’ll post for you. Congratulations, Cathy! You win a necklace on this blog too! Since you are local, I’ll bring them by your work in the next week. ENJOY! !